The fees are in US dollars. 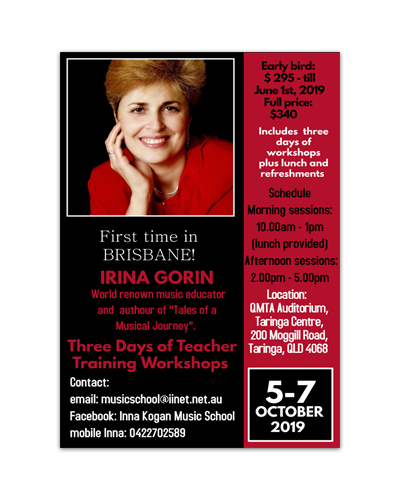 Level 1 of this workshop offers two days with Irina Gorin. You will participate in music teaching activities, learning and understanding her philosophy / concepts that provide the foundation to develop musical ability and healthy technical habits during childhood piano lessons. The completion of this two days course will give you the knowledge, confidence and tools to become a “Tales of a Musical Journey” teacher and be ready to start teaching with this curriculum immediately in your studio! Level 2 Level 2 will help you to wisely choose repertoire after completion of Tales of a Musical Journey, and will give you the knowledge needed to continue developing technical and musical ability in elementary to intermediate students, as well as the tools to correct bad habits in transfer students. You can choose to participate in Level 1 only, Level 2 only or both levels.